If you’ve thought about the frog versus toad question at all, you’ve probably assumed that these amphibians are two very different animals. After all, they have different kinds of skin—dry and pebbly for toads, and moist and smooth for frogs—and prefer different habitats: frogs like water, but toads prefer land. Frogs have slim bodies and long legs, and jump to get around; toads have short forelimbs and hop or walk. Frogs lay their eggs in clusters, and toads (generally) lay their eggs in long chains. 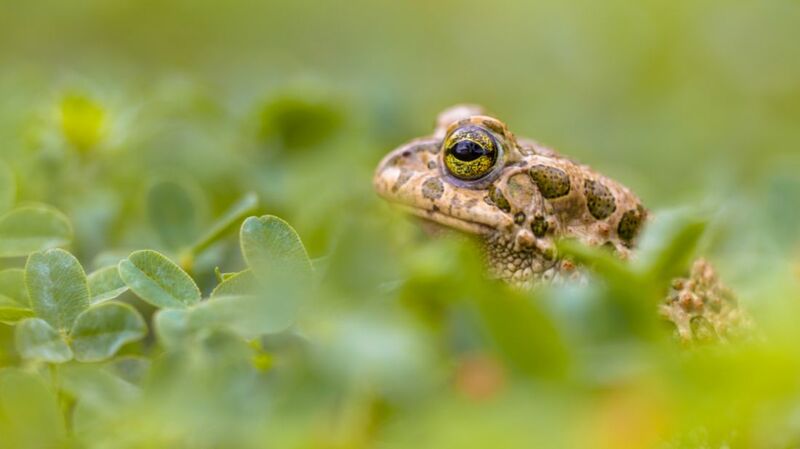 Toads also have big glands behind their eyes, called paratoid glands, which produce poison. There is a group scientists call true toads, which belong to the family Bufonidae, which consists of 50 genera and nearly 600 species, native to all continents except Antarctica and Australia (the cane toad, currently marching its way across Australia, was brought there in the 1930s). “They are recognized as a natural group based on DNA and skeletal characters,” Raxworthy says. For example, true toads don’t have any teeth, and the skin on the head is typically ossified to the skull. But even in that group, the distinction between toad and frog isn’t necessarily clear. “Many have a dry warty skin, but not all,” Raxworthy says. If you saw a member of the genus Atelopus, you’d probably assume it was a regular frog—but these colorful amphibians, which hail from Central and South America, are also true toads. And any number of frogs get called toads, even though they actually aren’t, like those in the Bombinatoridae family. Nature: It’s complicated!